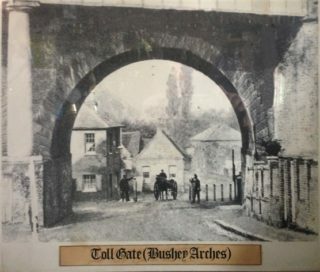 Seeing this picture of Bushey Arches with the horse and carts, reminded me of a sign that I saw in 1940, fixed to the wall of the arch on the right of this picture, it read, ‘Slacken Bearing Reign Before going up the hill’, I was 8, and did not know what it meant. My Mum informed me that when horses ran they stretched their necks, a bearing reign, apparently, was a short strap attached from the halter to the breast strap, used to prevent the horse from stretching its neck, and assisted in controlling the horse, however, a horse needed to stretch its neck when pulling a loaded cart, up a hill, hence the warning sign. Perhaps the hill may have been Chalk Hill! I took my children to see the sign in 1967, however, it had been removed, probably by a collector, or it may be in either Bushey or Watford Museum. As you went under the arch and up the hill there was a pub on the right and to the left was a short lane which led to a plastic bag company. The area was always pervaded by the awful sulphurous smell from the gas works. I have just remembered that, Luckett’s a family Taxi operator, had a garage under the centre arch of Bushey Arches, they were made to move, and a reinforced concrete building was built in its place for the military. I cannot remember where Lucketts went after being moved.